1.5 oz. 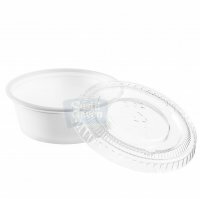 Cups and Lids- 2500 sets [CL1.5OZ] - $69.99 : SushiMaven.com, Your Source For Everything Sushi! This item is great for sauces. Its compact size makes it fit in any size sushi container you might be using!